From Littlehampton all the way to Greatstone in Kent. Situated on the East cliffs of Brighton, Telscombe Tye offers the ideal space for the Introductory Flying Lesson learning to fly two and four line power kites, before heading you to the beach. Telscombe is for everyone who wishes to brush up on their flying skills It works in all wind directions and is one of our most popular choices for teaching land skills. 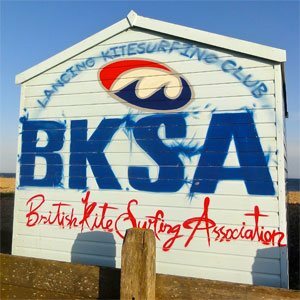 Lancing Beach is excellent for all styles and levels of kitesurfing from beginners to advanced. In the summer months the sea state state is flat for beginners and freestylers, where the winter months offer entry level wave conditions. There is a café, toilets and beach car park right by the green where you can suit up and organise your kit before walking over to the beach. Please take note of the beach zoning for the kiteboarding areas before launching. 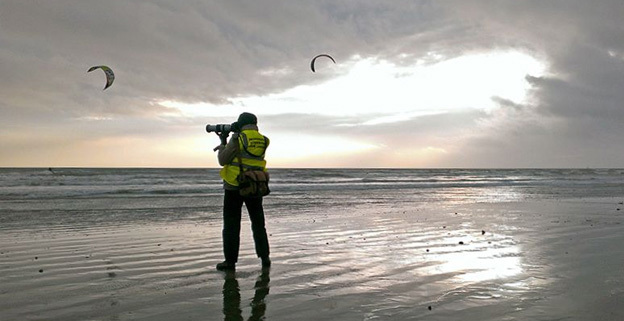 Gary Levett is Lancing local eye for action behind the lens, so look out the hi vi with two legs. Shoreham has been the home and training ground for many of the UK’s professinal windsurfers and is a great kitesurfing location. Suitable for very confident beginners to advanced kitesurfers, the best to time to ride is 2-3 hrs before and after low tide. Due to its steeper shelving beach and pending the wind strength the sea state can be a lot choppier than other local beaches further west which means in the summer months its great for entry level wavesailing. In the winter months it offers much more challenging conditions. Shoreham does benefit from the Sea Breeze effect but due to shape of the beach facing more South West the wind tends to be not as strong. Goring is a great location to kite 2 hours before and after the high tide mark. Any time after that you’ll experience a vast flint bed of rocks which is left to the brave to tip toe through the shallows. Timed well you can kite at a low tide location nearby and if you have the energy have another during the same day. Goring is not ideal for beginners so until you are proficient at staying up wind in various sea states I would watch and learn. There’s a great community there so when needing a helping hand there should be a friendly face to assist. Launching – Goring has a green behind the beach which locals prefer to launch from. It’s a bit leftfield when considering risk assessment so take note on how the current users manage their launch & landings. Eunice Bergin covers Goring’s local antics through the eye of the lens. Littlehampton beach offers varied conditions suitable for beginners to advanced riders. In the summer months the sea state can vary from flat water at low tide, to entry level wavesailing at mid tide. 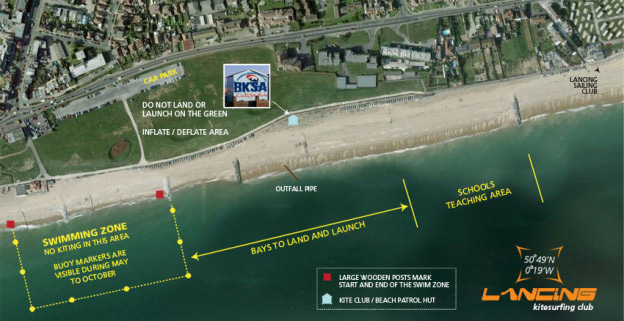 Hove beach is an acquired taste due to its tight launch zone and big beach breaks. Once your confident with your upwind ability and have a lot of hours of kiteboarding under your belt you may wish to give it a go. It’s not for beginners and has a smaller window of opportunity for when it is best to go and ride there. Generally speaking this is 2 hrs before and after low tide and is best during spring tides. Due to the shelf and steep angle of the beach the sea state can be rough, but great wavesailing at low tide. In the summer months when considering sea breezes, the wind can also be a force less than other beaches further east. This is due to it being the opposite side of the Adur Valley and it not benefiting from the ventury effect. There is local parking and lifeguards on site in the summer months, please check the signs for the kiteboard zoning on the beach. Brighton is not dissimilar to Hove beach, but more of the choice for kiters who live locally to the beach and don’t have transport. You’d have to be a confident intermediate or advanced rider to feel comfortable riding here. There is also the added challenged of a huge wind shadow created by the east Palace Pier which pushes the riding area closer to Brighton marina. A brave place to kite which offers erratic sea conditions in summer and winter. Seaford beach faces directly south west so it gets the full force of the English channel swells. This also means the wind is predominantly onshore for most UK summer conditions. At low tide the window of opportunity is small but if you have a few years under your belt you can enjoy excellent wave conditions near the east harbour arm. Be cautious there are many hidden obstacles under the water surface. Over the past 10 years Pevensey has been the choice for many kiters from Brighton when the wind blows from the NE and east. For the Pevensey locals a south westerly and southerly wind provide great conditions for blasting around, suitable for beginners to advanced. During the summer months the sea state getting quite choppy but this offers great entry level wave conditions at low tide. Pevensey has strict beach zoning in the summer so check the signs before setting up and launching or may get a hefty fine. Great Stone offers a great window of opportunity when the summer winds are coming from the north and north east. This is a great option for when most beaches in Sussex aren’t working. The sea retreats a long way out so offering all standards of riders a healthy amount of riding time through most of the tide. The sea state is often small surf but well spaced out and manageable for the newcomer. There is good local parking and toilets where you can suit up.